The awards of the Fuera de Serie magazine (the lifestyle supplement of the Expansión newspaper, also supplementing the El Mundo newspaper on Sundays next month), were presented on Tuesday the 14th in the Antigua Fábrica de Estrella Damm building in Barcelona. 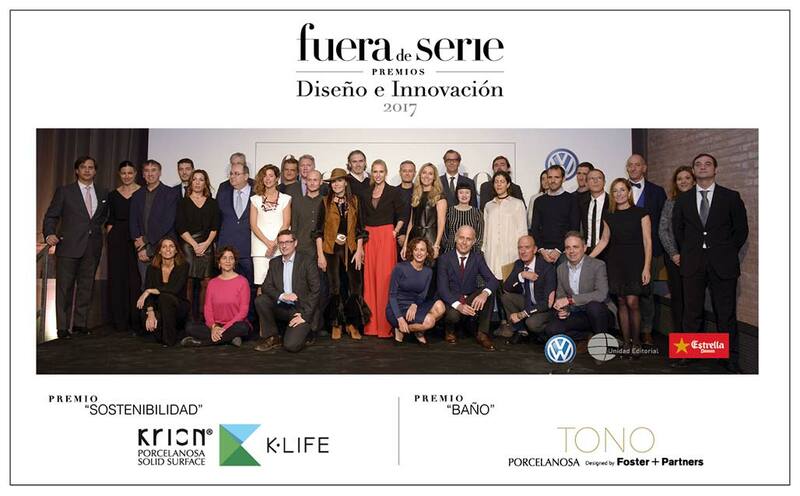 The judging panel of this second edition of the Fuera de Serie Diseño e Innovación 2017 awards magazine was made up of designer Mario Ruiz; architect Miguel de Oriol e Icaza; furniture expert Mónica Perez; entrepreneur and Santa Eulalia store owner Luis Sans; luxury sector specialist María Eugenia Girón; lifestyle journalist Chema Ybarra; and Fuera de Serie magazine editor Iván Martinez, who have awarded the innovative K-LIFE, from KRION PORCELANOSA SOLID SURFACE, in the “SUSTAINABILITY” category, due to the improvement that incorporates the capacity for air purification and elimination of bacteria. Among the awards was the “BATHROOM” category, in which the TONO Series by Foster+Parners from PORCELANOSA Group was awarded. Thanks to the possibility of personalising this series, three of the eight firms of the Group form part of it, and SYSTEMPOOL / KRION are proud to share this award with NOKEN, L’ANTIC COLONIAL and the rest of the firms of PORCELANOSA Group.